Editor's Note 8-2018: Due to a forest fire last summer, Eagle Creek is currently closed! Eagle Creek at its essence is a classic Oregon hike. Set in the Columbia River Gorge just outside of Cascade Locks, Eagle Creek was carved from the cliffs in the 1910s by the Columbia River Highway project to create a trail weaves in and out of the forest for stunning views of the tree-lined canyon. The hike is nothing short of breathtaking. 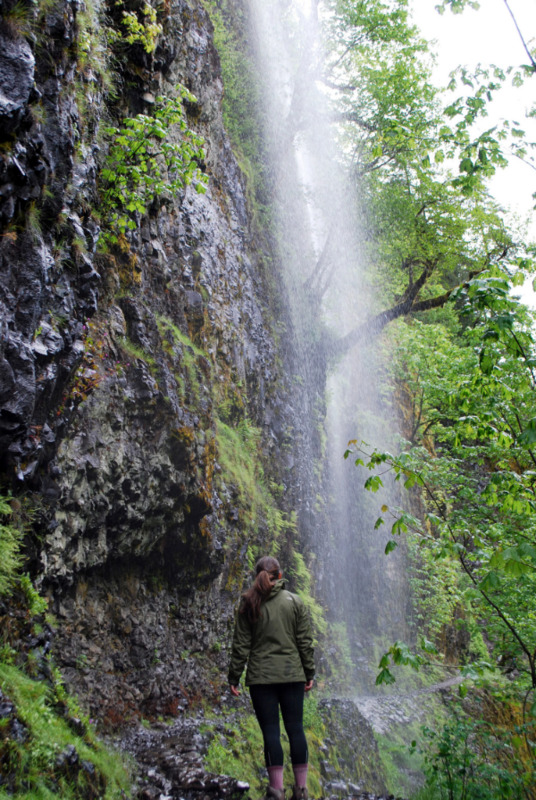 Look up from the trail and look behind you for all encompassing views of the Columbia River Gorge. Although the hike itself is on even ground and doable for most fitness levels, it is not for those afraid of heights. When coming out of the trees, the trail becomes increasingly narrow around a few tight bends that drop off into the canyon below. For this reason, take precaution with small children and overly curious dogs. Also, expect to get wet on this hike, especially in the spring when the water flow is high and pours over the top of the cliffs (but that’s all part of the fun.) Eagle Creek is must-do Oregon trail and is perfect for a half day to full day hike if traveling from Portland. This past weekend, I made it to High Bridge and back with a side trail detour to Punchbowl Falls for a total of 6.6 miles round trip. Unfortunately, daylight didn’t allow for my friend and I to make it to Tunnel Falls, but we will be back. While pausing to take in the scenery, my friend and I both decided that we are definitely backpacking to Wahtum Lake this summer. Drive about 45 minutes from Portland on I-84 east, take Exit #41 for Eagle Creek and stay right for a mile until reaching the parking area. 1. Hill, S. P. (2010). The Columbia River Gorge and Mount Hood. Oregon hiking (2nd ed.,). Berkeley, CA: Avalon Travel.